Grains are a staple of Middle Eastern cooking, not to mention being part of an extremely healthy diet. I love all of them and have a row of canisters on a shelf in my kitchen, each filled with a different kind of grain. I could easily sing the praises of each different one but I've noticed that farro seems to be my go-to choice lately. I buy the pearled version (common in most markets) and it's quick cooking, just 20 minutes, and requires no advanced preparation like rinsing or soaking. It also comes out very tender and, to me, has a milder flavor than many of the others. I find it's perfect as a rice substitute when I want something with more fiber and nutrition. And it's also a great substitute for barley in soups and salads. Like all grains, the fiber keeps me full longer so I'm not as likely to get the munchies later in the evening. Um...cookies don't count, right? 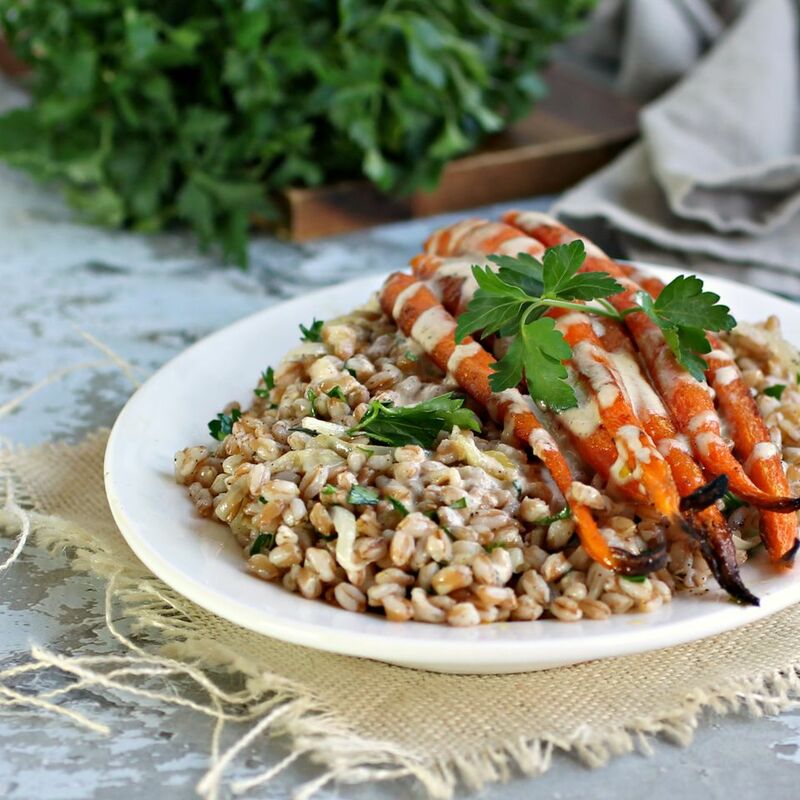 I paired the nutty taste of the farro with the sweetness of onions and carrots, the earthy taste of tahini and the smokiness of cumin for a great flavor combo! Combine 1 tablespoon of the olive oil with the teaspoon of cumin. Peel and slice the carrots and toss them in the cumin oil. Place on a baking sheet lined with parchment paper, season with salt and pepper and roast in the oven for 30 minutes. Add the farro, cover, reduce the heat to low and simmer for 20 minutes. Add the remaining tablespoon of olive oil to a skillet or cast iron pan along with the sliced onion. Saute for a few minutes until the onion is soft and a light golden brown. Stir the sauteed onion into the cooked farro. Make the cumin tahini sauce by combining the sesame paste, water, minced garlic, lemon juice and cumin in a bowl. Whisk until smooth and season with salt and pepper to taste. To serve, spoon the farro and onion mixture onto a platter, top with the roasted carrots and drizzle with the tahini sauce.